There’s nothing like a trip to the corn maze to welcome fall weather, and South Carolina features some of the best corn mazes anywhere. These mazes come in all shapes and sizes, and can prove challenging for even the most astute problem solvers. 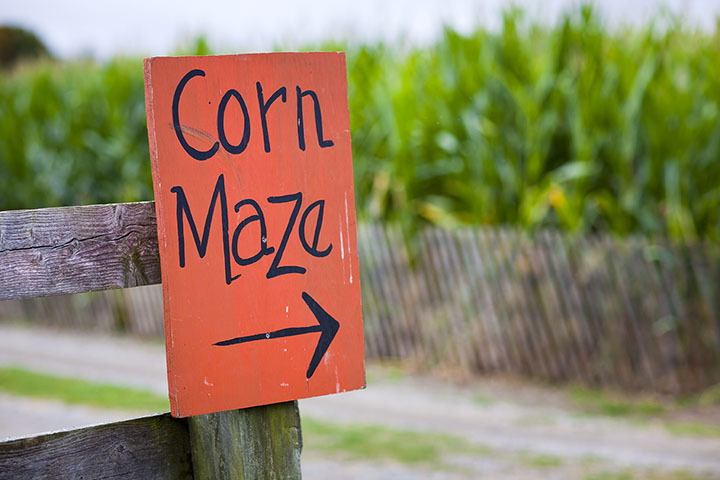 Perfect for family fun, corporate team building, or an afternoon activity with your best friends, these 10 best corn mazes in South Carolina are not to be missed this fall. As if you needed another reason to visit Boone Hall Plantation, you’ll find the best corn maze in the Lowcountry here. This eight-acre maze winds its way across the grounds of the iconic historical site. You have your pick of the short version, which is perfect for families and others who want to avoid a lot of walking, or the longer version that’s chock full of twists, turns, and fun challenges. Entry to the maze is free with paid admission to the pumpkin patch. Each fall Denver Downs outdoes itself with an impressive corn maze that can be enjoyed on the ground or visually appreciated from above. The 10-acre maze provides fun for all ages with a new theme each year. They also host a special flashlight maze where you can bring your flashlights and glow items for a trip through the maze under the stars. This haunted house/corn maze experience is not for the faint of heart. Guests 12 and up can make their way through a 3D mind warp before being left to navigate the dark two-acre corn maze to make their way back to civilization. A family tradition for many, the McLeod Farms corn maze is fun for all ages. Once you complete the maze, there’s usually plenty of other family friendly fall activities to enjoy on the farm, such as picking your own pumpkin and taking a stroll through the Roadside Market. Here you have your pick between two mazes, depending how much you like to be scared! Each maze offers family-friendly fun and is perfect for all ages. Kids aged five and under are free! This haunted attraction will have you questioning your own sanity. Guests can enroll in demented clown school and get a practice round on the indoor/outdoor maze before trying your luck at the Forgotten Asylum Corn Maze that’s brimming with sights and sounds of sheer terror. This five-acre maze offers plenty of word games and puzzles to help you make it to the finish line. Guests can visit the maze during the day and enjoy other attractions on the farm, or you can opt for a flashlight experience after the sun goes to sleep. The corn maze experts here always have a new design to delight its visitors each year. Open from the end of September until the end of October, guests of all ages will enjoy getting lost here. Each year brings a new and challenging design for the corn maze at Thompson Farm & Nursery. Open every weekend from the end of September until the end of October, guests can enjoy the corn maze by day, or join in the after hours fun on Flashlight Fridays, Saturdays and Sundays. View more South Carolina Corn Mazes.